Why is Coventry University the UK’s Top Modern University? Coventry University was named 'Modern University of the Year 2019' by the Guardian University Guide again this year, but what makes it such a special place to study as an international student? A key strength of the University is their focus on the employability of international students, with a range of industry-leading initiatives that prepare them for graduate employment in place throughout your time of study. Learn more about employability and four other reasons why Coventry stands out below. If you are interested in studying at the University, Coventry have a wide variety of courses available for January 2019 entry. Arrange your free consultation in London or Manchester to get started. Data from the Higher Education Statistics Agency revealed that Coventry provided nearly 3,000 student experiences abroad in 2015/16, making it a leader in international mobility. In addition, Coventry scored 87% for overall positive student satisfaction compared to the UK average of 84% (National Student Survey 2017). Coventry University is now ranked in the top ten across 12 different subject areas, including film production and photography (1st); economics (6th); mechanical engineering (7th); hospitality, event management and tourism (4th); and nursing and midwifery (7th). Coventry focus on the future employability of international students, with a range of industry-leading projects preparing graduates for their future career. The Centre for Global Engagement at Coventry offers students the chance to study or work abroad, gaining international experience and the skills to become globally employable. 97% of Coventry graduates were employed or in further study six months after graduation (DLHE Survey 2015/16). Ranked as one of the ‘Best Student Cities in the UK’ by QS Best Student Cities 2018, Coventry is an exciting place to live as an international student. There are a wealth of sporting, cultural and social activities to enjoy, and the University’s own buildings are all within touching distance of whatever your interests may be. 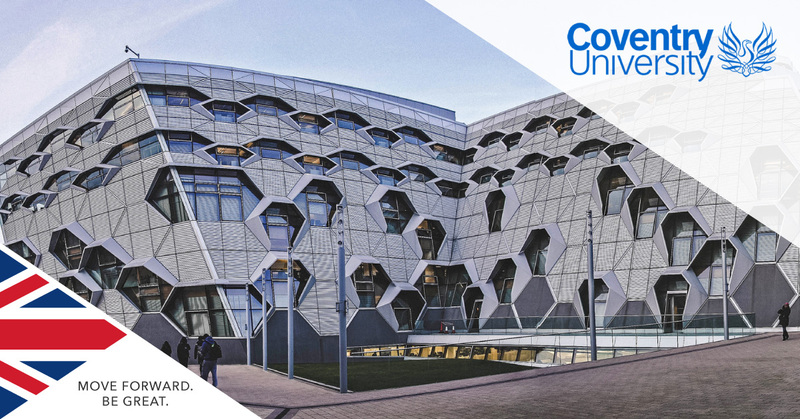 If you are interested in applying to study at Coventry University from January 2019, make sure to arrange a free consultation with SI-UK in London or Manchester today.